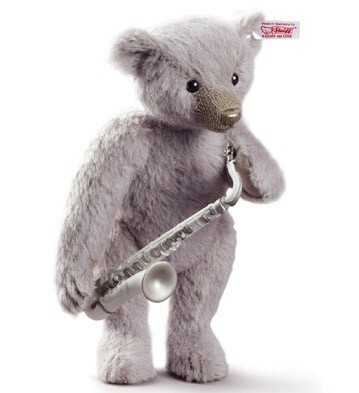 Now available is the latest Lladró & Steiff collaboration the Lladró Saxophone Player Bear. The bear is made from beautifully soft and warm alpaca fur in dove grey. His delicately shaved muzzle reveals his hand-embroidered nose and mouth of cream and silver thread. He is playing a Saxophone which has been crafted by the Lladró team. The sax is made in matte porcelain and decorated with platinum luster. He measures 26cm and is being produced in a Limited Edition of 1,000, and is sure to delight both Lladró and Steiff collectors. The core essence of Lladró and Steiff are brought together in this charming character which delights us with the melody of The Pink Panther Theme, by Henry Mancini, thanks to the musical box inside and the windup key on the back of the bear.